I LOVE my green smoothies with every inch of my heart. I love the variety, and the unlimited creative nature to them. Or would that be creative nature for me to experiment with? Either way, I love that I can literally throw anything into them. 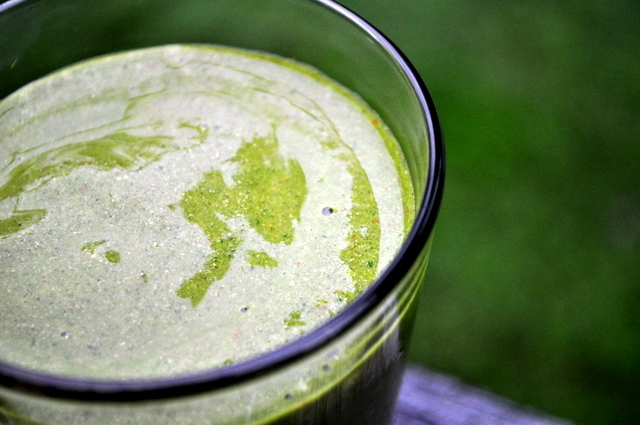 Don’t let the green fool you, green smoothies are very tasty. Of course, sometimes they taste incredible, and sometimes they taste completely questionable. But overall, I’m drinking to my health. I ran out of protein powder a week or so ago and since them I’ve tried coming up with tasty smoothie recipes without. When I first started blending my greens I never used protein powders and I think I’ve gotten a bit too reliant on having these powders be the bulk of my recipes. There is nothing wrong with using protein powders, sparingly, but I do find that I’m liking how I feel on my protein powder-break. The smoothies are still just as thick and creamy, and I’m using other sources for the protein. 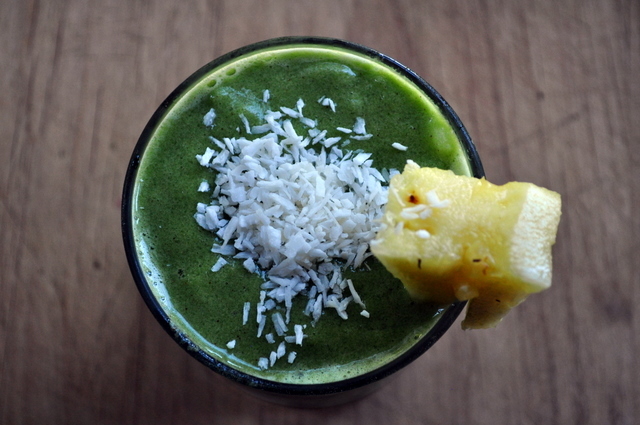 Have you tried green smoothies yet? What are your favorites? If you haven’t, get on it! Who doesn’t like a Cinnamon Roll [Smoothie]? I guess it’s only fitting that today’s a smoothie recipe- go check out my review of Svelte Protein Drinks over at Go Dairy Free if you want some store-bought grab-n-go containers. Makes 1 large, sweet and spicy, satisfying smoothie. Gluten-free, dairy-free, healthy, and Paleo, even. Blend all ingredients in your blender. Taste and adjust honey, water, or cinnamon as needed. Use this recipe as the guide not the rule. Make it your own by adding in or taking away anything you please. Ingredients like nutritional yeast, alfalfa grass powder, and bee pollen are all fun add-ins but not essential. Nutritional yeast contains lots of great protein and tastes cheesy, making the smoothie have a “cheesecake”-like flavor. The alfalfa grass powder is a green powder of dehydrated grass that boosts nutrition of the smoothie and adds a little extra energy. And the bee pollen is exactly what is sounds like: Bee’s pollen. It is a powerhouse for naturally occurring multi-vitamins, minerals, proteins, amino acids, hormones & enzymes. Have fun! And check out all the other smoothies recipes I have posted in the recipe archives. 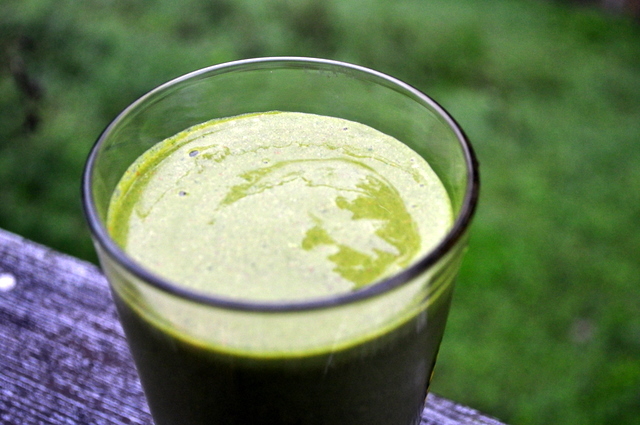 wow, there are a lot of scary ingredients in that smoothie … cayenne, nutritional yeast! hmm… i’m intrigued! i might leave out the nut yeast & add in some cocoa & cinnamon. make a mexican chocolate smoothie! YUM!!! ooo this sounds fun. im definitely in a smoothie rut right now-strawberries, spinach and banana…day after day haha. ill have to try this! I drink green smoothies all the time, but haven’t tried it with cayenne! Can’t wait though – I am addicted to the stuff. My favorite flavors lately have been sweet potato or cherry-butternut squash. Independently, strawberries and kale are in my top 5 favorite foods. I have never even imagined a possible combination of the two! 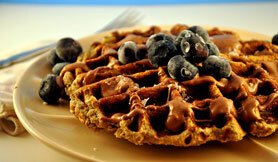 I am so intrigued, I may try this for breakfast soon. 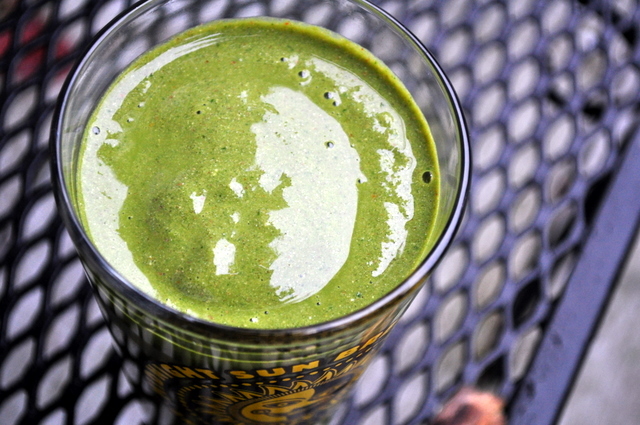 Are you using a blender or a juicer?